​To the left you can see the kit built both as an ultra lightweight slope soarer with a front mount motor and as rear motor FPV and combat plane that has an extension. Both fly extremely well and are variations you can build with the same kit. The Gladiator XL is a large FPV platform and sport plane. It was previously known as the Deep Reaper but due to name confusion we gave it a new name. It is still the great flying plane it always has been except we recently enlarged the blunt section in the center to fit bigger propellers and more FPV gear. In a day when many manufacturers are going to smaller planes we still have big 100% EPP, big, stable FPV and sport planes that can fly slow and are easy to hand launch and fly like a dream. The Gladiator XL has an improved airfoil and amazing FPV design!!! Some of the most impressive FPV videos ever have been shot from this plane. (Watch the FPV videos on this site!!!) 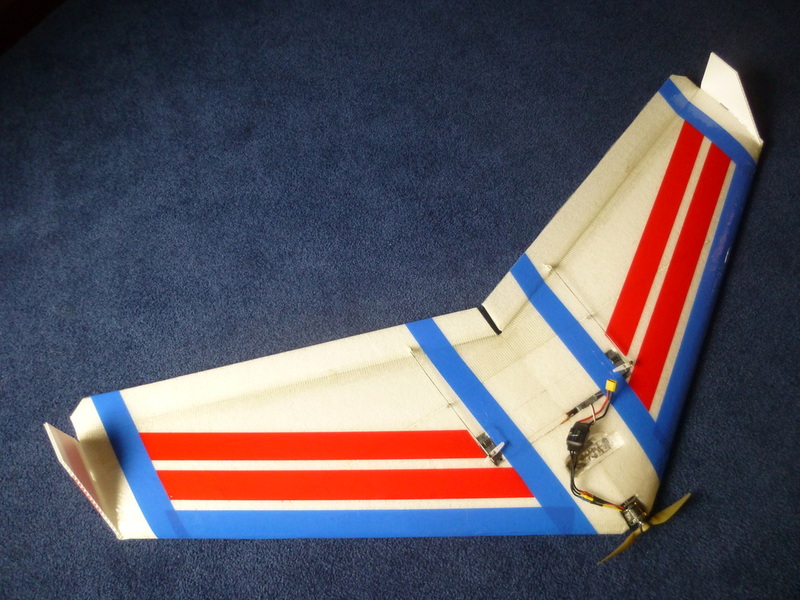 It is also a great flying wing for those who aren’t flying FPV who want a big gentle wing. The Gladiator XL is a stable in slow flight but is still aerobatic for the sport flyer. We recently built a Gladiator ultra light modification with a front mounted motor as can be seen above. It has become one of my favorite planes because it is powerful and quiet. One of the advantages of putting the motor on the front is the motor is ahead of the CG so the plane is easy to balance. The front motor Gladiator only has one 2700 3S lipo battery to balance it. It will fly at 1/3 throttle with authority. This kit is a super bargain at under $100 especially when you consider the kit includes laminate and the 9″ extension at no extra charge. We offer a buy 5 get one free on the all of our kits. It is built like our EPP combat planes so it can take abuse and protect your expensive FPV gear. It is stable on launch and has a gentle glide but can carry a heavy load of gear and batteries. It is very controllable and does not snap roll or tip stall with a load even at lower speeds. Experienced FPV flyers report it to be the most stable and easy to launch wing platform they have flown of this size. Please log in and join the discussion at: RCGroups.com.